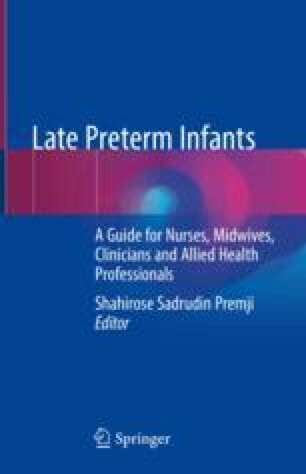 Late preterm infant (LPI) is a terminology that reflects our understanding that these babies are born at a critical time when the brain, lungs, and other body organs are still growing and developing. We have attempted to share the growing body of evidence that provide insight into the characteristics of these infants that threaten their adaptation outside the uterus (i.e., womb), present as challenges to health-care providers and parents, and impact growth and neurodevelopmental outcomes of LPIs. LPIs have taught us much along the way; however, work place organization (e.g., technology, policies, procedures) creates competing demands in skillfully caring for LPI. We find that LPIs are sometimes treated as normal infants leaving parents with an impression that these babies are not a “big deal.” The myths (i.e., false beliefs or ideas) that frame our (health-care providers, parents, and families) perspective about LPIs create difficulties in being responsive to LPIs and hinder our ability to care for LPIs in ways that will enable them to reach their full potential. In this final chapter, we share misconceptions about LPIs and their families and provide facts that will provide pause to rethink your approach to care.